When it comes to attracting and retaining the attention of a technologically sophisticated generation of college students — especially those seeking careers as tech leaders — an optimally designed and executed online presence can be the most important tool in a university’s promotional toolkit. 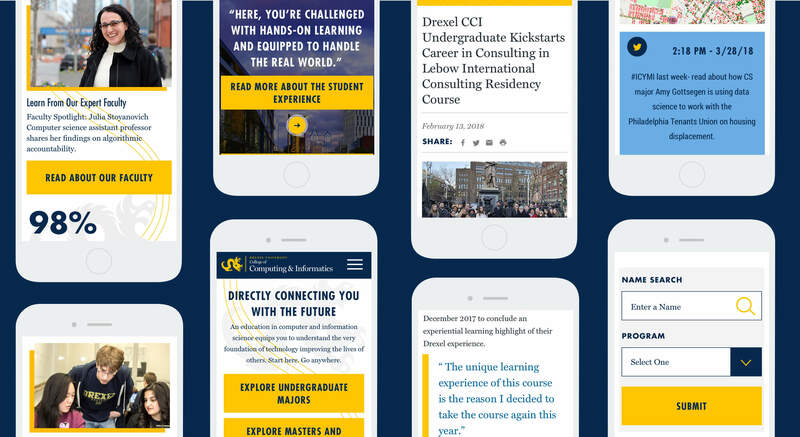 When we sat down with the web team at Drexel University’s College of Computing and Informatics (CCI), we found that they embraced this philosophy and were looking for help in several key areas to improve their overall user experience. The team shared with us that their current and prospective students were challenged with finding the information they needed on the existing site — especially in vital areas like academic programs and admissions — and that the site was also generally underperforming in differentiating their graduate and undergraduate programs and generating interaction with and excitement about their world-class academic offerings. 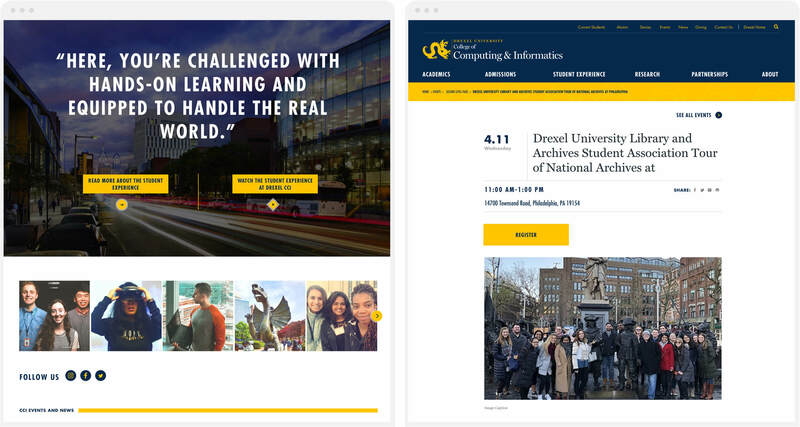 The Drexel team wanted us to provide a user-focused content strategy and information architecture and deliver a unique and modern design mockup that their technology team would then apply as they built out the new site in their existing platform, Sitecore. Starting with a student survey and focus group, we dug into questions like, What leads prospective graduate students to CCI? And what are prospective students looking for in a program — especially international and undergrad? We also identified personas and ran a full content audit and competitor analysis to look at content gaps and opportunities to restructure the overall UX. We found that, generally speaking, grad students were more clear than undergrads about the information and programs they seek — but both groups needed a stronger starting point and easier access to content. The full range of academic programs had to be presented in a more engaging manner that would speak to the respective audiences, and the vast content collection needed to be more visually dynamic overall. We then conducted sitemap user testing for current students and recruits — essentially a random series of “where would you go?/what would you do?” tasks that requires participants to find answers by navigating a menu that includes the new pages in the proposed sitemap. The goal was to establish the decision tree that would guide grads and undergrads to the right program based on their knowledge level. We discovered one of the main challenges was presenting programs and providing guidance for users who might have an interest as broad as “computers” or “data analysis” but have no idea which CCI programs are the right match for them. A follow-up design user test gave us insight into how users would complete various tasks based on the proposed designs, which validated decisions we made in the design strategy and allowed us to make final changes if a particular task was unclear. 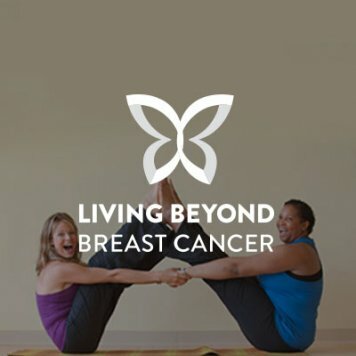 Guided by the College’s existing branding, we utilized the modules available on their existing site platform to create an effective front-end design focused on guiding users through the site, logically classifying programs and courses, and streamlining all top-level menus to increase clarity. 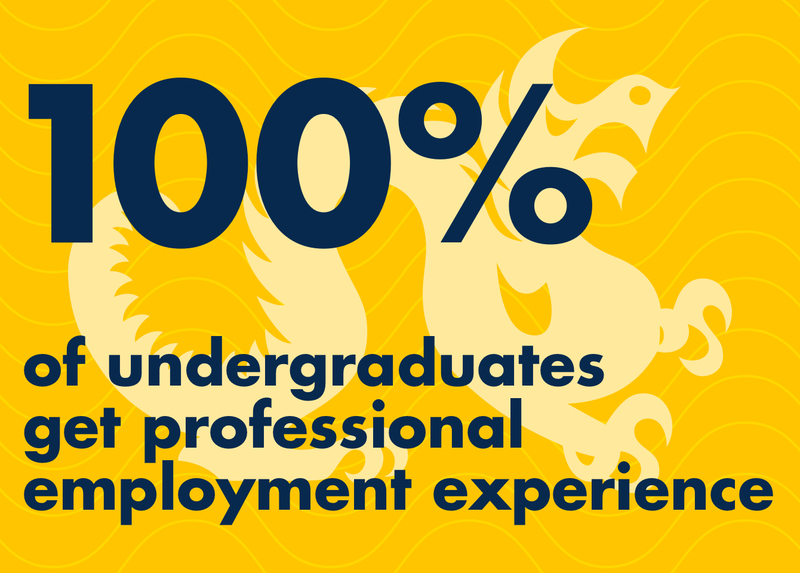 The solutions we created include new features that convey a more personal look at the Drexel CCI student experience, including a much more robust Co-Op Experience section that emphasizes the uniqueness of this renowned program and its hands-on learning opportunities, as well as personal Impact Stories, and Student Research landing pages. 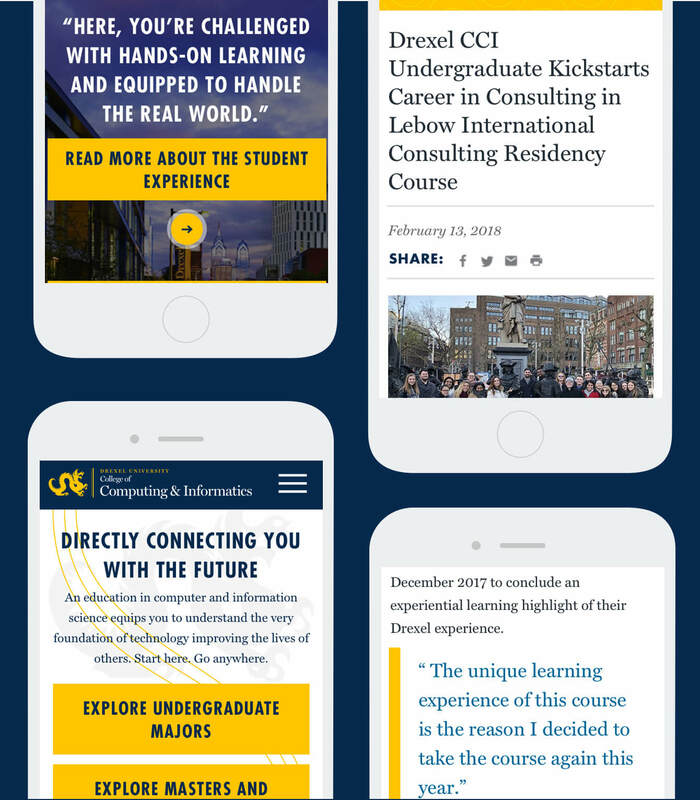 We reworked the navigation and streamlined the search features for Admissions, Academics, Staff & Faculty pages, and created social media teasers that link to related content to reinforce key themes. Finally, a new blog feature now accommodates stories, photo-driven editorials, podcasts, and more. From an imagery perspective, we focused on conveying the College’s benefits, opportunities, and impact on related markets and industries through images and embedded video throughout — building excitement for current and prospective students both now and well into the future.